For almost 30 years, Hearns Heating & Air conditioning has been providing quality wood and gas heaters to keep families in the Midland and Hills area warm and cosy in winter and air-conditioning to give relief from long hot summers. Current owner, Lynton Vivian took over running the store in 2007 from founder Darren Hearn. Lynton and staff, Sophie and Phil have many years’ experience in home heating and cooling so you can have total confidence that you will receive the right advice for your home. 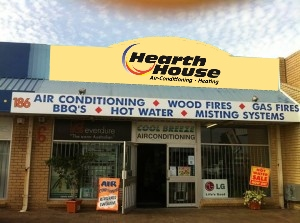 Hearn’s Heating and Cooling joined the Hearth House group in 2015 to service areas from Ellenbrook, Bullsbrook through the foothills to Forrestfield as well as the Hills areas such as Glen Forrest, Darlington, Mundaring and out as far as Northam and Toodyay. Contact us today to speak to one of our friendly and knowledgeable staff about your air-conditioning and heating needs.